Company's investment and Community Support Spotlights Long-Term Commitment... All Systems Go! WACO, Texas, March 22, 2018 /PRNewswire/ -- The Sherwin-Williams Company (NYSE: SHW) today celebrated the grand opening of its new Waco, Texas Distribution Service Center. This state-of-the-art S-W Global Supply Chain facility is a key transportation hub in moving paint to serve our customers. 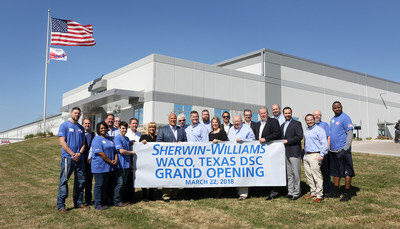 Sherwin-Williams Celebrates New Waco Texas Distribution Service Center Opening... Company's investment and Community Support Spotlights Long-Term Commitment…All Systems Go! On a daily basis, 326 dedicated associates load 65 tractor trailer trucks that hit the road delivering 3 million pounds of paint product to 700 S-W paint stores across 8 states (TX, LA, OK, AR, NM, CO, MO, KS). S-W's $39 million investment along with Waco community support, spotlights the company's long-term commitment and partnership. 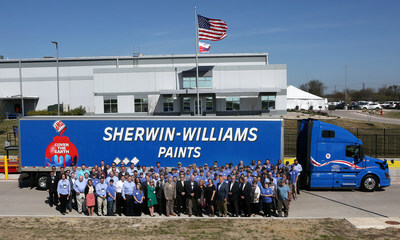 This is a great day for the Sherwin-Williams Company and the Waco community. S-W values this partnership. The company has a long history here and we look forward to the future. Sherwin-Williams and the Waco community have both made major investments and we think this innovative facility will be a major boost for our customers and the region. 615,000 square feet: 10 football fields/14 acres. Built in 166 days. S-W investment: $39 million. Work Force: 326. During the year 234 S-W Waco tractor trailers cover 12.4 million miles delivering paint products to 700 S-W paint stores. The 12.4 million S-W Waco miles would be like circling the earth 498 times or 52 trips to the moon. Sustainability/Green Initiatives: 2 fuels driving success-good for the environment and our customers. Carbon footprint reduction: Many truck deliveries are done at night or early morning. By avoiding traffic, S-W can reduce drive time and save fuel. Continuous recycling & waste reduction program: Waco recycles 86% of its materials. Plastic wrap (42,000 lbs. ), wooden pallets (77,000 lbs. ), cardboard (42,000 lbs. ), scrap metal (21,000 lbs.). Our LED lighting system with on/off motion detectors reduces energy consumption. Community Involvement: 50 activities a year with Habitat for Humanity; Charitable donations/sponsorships; Greater Waco Chamber LEAD Program and Technology Business Briefings; Disaster relief assistance. The company manufactures products under well-known brands such as Sherwin-Williams®, Valspar®, HGTV HOME® by Sherwin-Williams, Dutch Boy®, Krylon®, Minwax®, Thompson's® Water Seal®, Cabot® and many more. The Sherwin-Williams Performance Coatings Group supplies a broad range of highly-engineered solutions for the construction, industrial, packaging and transportation markets in more than 115 countries around the world. In 2017 Sherwin-Williams reported sales of $14.9 billion. The company employs approximately 60,000 associates worldwide. It has a prominent market position in architectural paint in North America, South America, China, Australia and the UK. In industrial coatings, the combined company is a global market leader in packaging coatings, coil coatings, general industrial coatings and industrial wood coatings. Sherwin-Williams shares are traded on the New York Stock Exchange (symbol: SHW). For more information, visit www.sherwin.com.